Summer RISE is an opportunity for rising Montgomery County Public Schools (MCPS) juniors and seniors to explore real-world career-based opportunities from July 8-26, 2019. The initiative is led by the MCPS Partnerships Unit. Local businesses, government agencies and non-profit organizations volunteer to bring rising high school juniors and seniors into their workplaces to teach students about their organization, how it functions as a whole and the different career fields a student can explore within their organization. These participating businesses and organizations are able to explore Montgomery County student talent. MCPS prepares students for their experience at host organizations through a mandatory professional skills and financial literacy workshop. Student participants are provided with a $300 stipend to cover incidental expenses such as clothing, food, office supplies and transportation after they complete the 60 hour/three week Summer RISE program. Your gift/contribution will help support, promote and continue the academic components of Summer RISE. 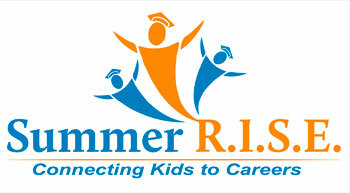 You may learn more about the program, student experiences, and host testimonials at www.MCPS-SummerRise.org.